The streets of Havana are sizzling with activity! Powered by the infectious energy of the Cuban people, the Projecting pARTticles team is currently hard at work on the installation, double-checking measurements, climbing scaffolding, making adjustments. Our Cuban friends have been invaluable in the process, lending their expertise and resourcefulness to transform the team’s vision into reality. The installation, Origination Point, will be up and running with the opening of the Biennial this Friday, May 22. 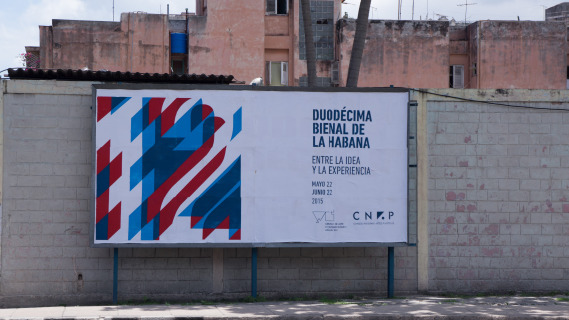 It is housed in El Pabellon, a massive indoor/outdoor structure that connects two busy streets in the Vedado district of Havana, nicely complementing the theme of the exhibit: “Between, Inside, Outside.” Other artists will set up in different locations of El Pabellon’s expansive atrium, and performances will punctuate the spaces between to inaugurate the exhibit on Saturday, May 23, beginning at 11 am. Stay tuned for more from the Cuban front!